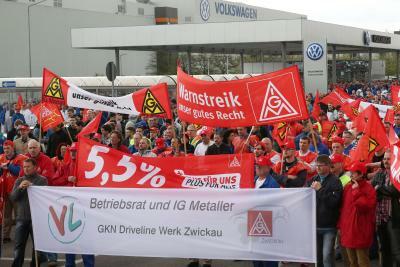 VW workers staged a several-hour “warning strike” in Zwickau, Germany, on May 13, demanding a 5.5 percent raise. German plants have a dual representation system with both a union, which can strike, and a works council, which is pledged not to. The United Auto Workers have asked VW to agree to a similar set-up in Chattanooga, Tennessee. Photo: I. Pastierovic/IG Metall. The United Auto Workers, so long frustrated in their attempts to organize foreign-owned auto plants in the U.S., may have found a different way in. When Volkswagen began building its VW Passat in Chattanooga, Tennessee, in 2011, and union organizers began talking with workers, UAW President Bob King also sought help from the metalworkers union in Germany, IG Metall. IG Metall members on VW’s plant-level and global works councils began pressuring top management. The only big VW assembly plant without a works council was in Tennessee, they noted. VW should set one up there, too. The UAW sent local workers to a meeting of the VW Global Works Council. But U.S. labor law—what’s left of it from the National Labor Relations Act of 1936—says management may not “dominate” a labor organization nor “contribute financial or other support to it.” Works councils operate with company money (see box at right). It’s not a “workers’ council.” The word “works” here means “factory” or “facility.” In English we use the word in names like the Bath Iron Works, a big shipbuilding facility in Maine. Works councils were established in Germany through a 1920 law, specifically as an alternative to the workers’ councils that had sprung up in many factories after World War I. Workers attempted to take direct democratic control of the plants through the workers’ councils, on their way to a revolution that would take over the government. That uprising was thwarted. The works councils, then, were the German government’s attempt at pacifying militant workers. There were mass demonstrations by workers who opposed the works councils law, charging it would hinder workers’ independent organization. Forty-two were killed by police and a state of emergency was declared, but the law went into effect. The works councils were abolished by the Nazis but reinstated after World War II under the military government of the United States and its allies. The council’s explicit charge is to work for the interests of both workers and company. Members must keep “the peace in the establishment.” They may not lead a strike. 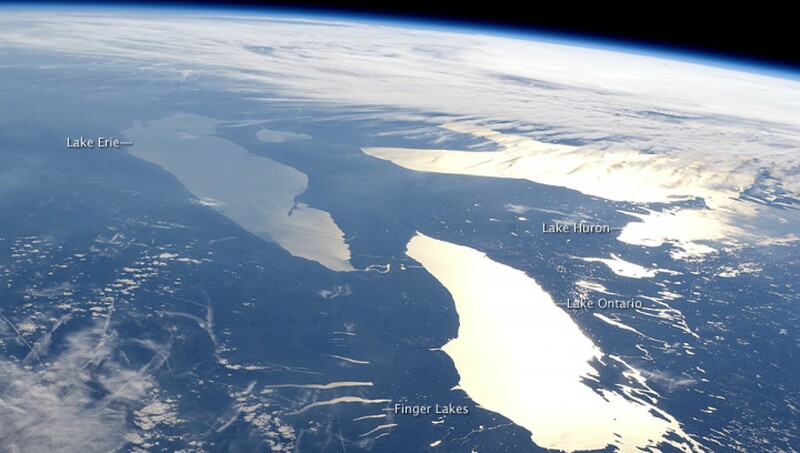 Their job is to find non-conflictual ways of dealing with new technologies, reorganization of jobs, and plant closings, and they bargain with management over these issues. But worker representation is actually split into two parts. While the works council deals with shop floor issues, bargaining over wages is done at the industry level by the union, with, in the past, one standard wage pattern for an industry. Since the 1980s, though, union standards have been weakened as works councils very often have accepted management’s plans for lean production and permitted management to play off workers in different workplaces against each other. Works councils’ legal obligation to cooperate with the management of their own company was a solid foundation for such whipsawing, and works councils backed the opening of industry-wide contracts to allow company-specific concessions on wages and hours. Wolfgang Schaumberg was a works council member in GM’s Opel plant in Bochum, Germany, for 25 years. He was elected on a slate running in opposition to the official union slate. He gives an example of how the works council worked alongside the union contract: The IG Metall national agreement of 1984 reduced the work week to 35 hours, to be achieved over the course of 11 years. How to set up the new time off was the task of the works council at each plant. In the Bochum plant in 1995, the majority of the works council, and GM management, wanted to keep working eight hours a day but take days off during the year. But opposition members on the works council organized a rank-and-file vote, which resulted in a work day of 7.5 hours, 37.5 a week, with the rest of the reduction in days off. As head of the council’s dismissals committee, it was Schaumberg’s job to bargain with management to defend fired workers. His description of a typical day sounds much like that of a full-time shop floor union rep in the U.S.: meetings with management, talking with workers about what the works council can and cannot do. While right-wing works council members made a priority of their charge to work for the good of the company, opposition members like Schaumberg would organize collective actions like coming together to the works council office to press their demands or grievances; “we often stayed in or in front of the office longer than the break time,” he said. Thanks to Wolfgang Schaumberg and Boy Lüthje of the Institute for Social Research in Frankfurt for help on understanding works councils. A works council would be legal under U.S. law only if the workers involved also had their own independent representative: a union. So top VW executives, acceding to the pressure from around the world, told managers there not to stand in the way of a union. Obviously, that gave a big boost to the UAW’s collection of union cards. In early September the union announced that a majority of the 1,500-1,600 union-eligible workers had signed. We, the employees of Volkswagen, are joining together to create the most success­ful Volkswagen Chattanooga facility possible. We recognize that our job security and our success as employees are bound up with the success of our company. We commend and embrace the Volkswagen philosophy of co-determination and aim to contribute to the production of the highest quality products, safe and efficient production methods, and the overall profitability of Volkswagen. We believe that the best way to actively participate in our company and to contrib­ute to VW’s continued success is to achieve representation as our colleagues have at the other 61 Volkswagen facilities across the globe. We choose to be represented by the UAW because, by working together, we can make the Passat the #1 car in the United States. Chris Brooks, a founder of the community organization Chattanooga Organized for Action, has been active in attempts to counter this deluge, aimed at VW workers, VW management, and public opinion generally. Brooks, who now works for a teachers union, has spoken at forums and written an op ed about the financing of such groups. He says the opposition is three-pronged: the Tea Party, the Chamber of Commerce, and the political establishment, including the governor and Senator Bob Corker. Taxpayers made a “massive investment” to bring Volkswagen to Tennessee—half a billion dollars from the government of the right-to-work state, Brooks pointed out. If workers are involved, he hopes, there’s more chance they can convince the company to increase its investment in the plant. “They’re nice paying jobs but there’s not any sense that you can’t just be let go,” Brooks said, citing some layoffs last summer. The crucial fact animating all the discussion, pro and con, is that VW is now deciding whether to build a new seven-passenger SUV (concept name: CrossBlue) in Tennessee or in Mexico. “The absolute first is job security,” Walden said. “In the Great Recession we’ve had I was laid off four times. And I had it better than a lot of people did. “Getting a union in will allow us to get a works council in, and getting a works council in will put us in the spot to get that SUV. A lot of us feel we are being left out of some discussions, some decisions. Both Ford and GM have long had union plants in Tennessee. GM’s Saturn factory was, in fact, widely touted as a model of union-management cooperation and had an elaborate structure of “counterparts” (workers and managers paired up) who were supposed to co-manage every aspect of production. But the UAW has still faced an uphill climb with a workforce unaccustomed to the union concept. Unlike the 80 percent Black Nissan plant in Mississippi, the UAW’s other big target in the South, a large majority of the Chattanooga workers are white. Typically, African-American workers have been more open to unionization. Walden had held mostly service and retail jobs before. “This is the first time I’ve been in a place that’s in a field that’s used to unions,” he said. He asked many questions before deciding the union was the way to go. An anti-union group submitted 563 cards opposing the UAW October 4, with workers revoking their signatures if they had signed union cards and requesting a decertification election if the union is recognized. Walden guessed that some of those signatures might be from employees not eligible for the union. The group’s reasons for opposing a union range from “trusting” that management will continue wage parity with the Big 3 through fear of a shutdown through the UAW’s record on allowing temps and two-tier wages. The UAW wants VW to recognize the union without an election, but Volkswagen says it’s in no hurry on either the union or the works council. Talks with the union are likely to continue into next year, a Tennessee human resources official told Reuters. A version of this article appeared in Labor Notes #416, November 2013. Don’t miss an issue, subscribe today.